eBay (12 Pairs) MCR Safety Polyurethane Coated Nylon Work Gloves Economy PU coated Nylon provides good tactile sensitivity, dexterity, and abrasion resistance. 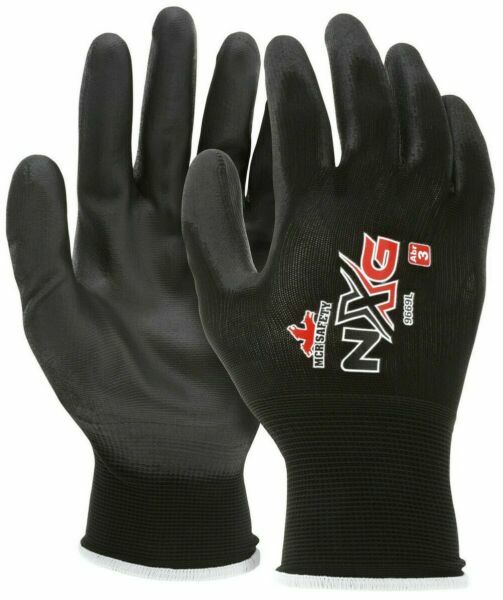 They feature a 13 gauge Nylon shell with polyurethane palm and finger coating. These gloves come with color coded hem sizing and are individually poly bagged by the pair. Made without Silicone.12 pairs (1 dozen)13 gauge black nylon shellBlack PU coated palm and fingertipsIndividually poly bagged by the pairColor coded hem to identify sizes On Aug-29-18 at 07:47:53 PDT, seller added the following information:WARNING: This product can expose you to chemicals including N,N-Dimethylformamide, which is known to the State of California to cause cancer. For more information go to P65Warnings.ca.gov.